Once you set up the wrongwarp, you can infinitely wrongwarp to any outside map in the void to completely obsolete tweaking, and also allows you to skip huge portions of routes since you can just wrongwarp to the data you need. The wrongwarp I'm refering to will allow you to teleport to the last area you used explorer kit, used an elevator or some obscure things like when you end the game in which case you'll warp to the players house. by underflowing your 32 bit coordinates and using explorer kit beforehand you can even warp to fake sinnohs since your values will be stored in 16 bit when using explorer kit. our coordinates are stored in 32 bit, but almost any function in the game that stores coordinates to warp to them saves them in 16 bit. When talking to the Union room girls, the game warps you to Union room, but the moment it warps it saves your current coordinates. Usually your 32 bit Y value coordinate is Y = 0000 0002, and the stored 16 bit value would be 0002. When you leave union room you would therefore teleport to Y = 0002, which is the same as 32 bit Y = 0000 0002, so there's no issue normally. When you use the void to get above the lady though, you can talk to her from above, causing the warp to happen 3 tiles higher. This puts your 32 bit coordinate at Y = FFFF FFFF, and since the game stores your value in 16 bit, when leaving union room it teleports you to Y = 0000 FFFF instead. This is only a coordinate warp in itself, which is not that useful. But, if you reset the game after talking to the girls, tha game warps you to bytes located at [Base] + 1488 instead. This can store your position when using union room, but fails to overwrite them if you talk to the girl from above. The bytes are also overwritten when using Explorer Kit, using elevators or set to twinleaf playerhouse when you finish the hall of fame sequence. Therefore you can now warp to those values instead. 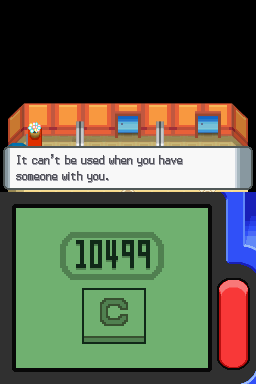 Not only this, if you then later go back into the top floor of the pokécenter, the game runs a mapscript that pushes you 4 tiles down, which is enough to force you into the void. then we can go above the map again, and in less than 30 seconds we can warp to our last explorer kit location once again. This wrongwarp can also be used to teleport to fake sinnohs if you used explorer kit in an area with underflown 32 bit coordinates, similar to what I said before. FFFF FFFF would become 0000 FFFF, but since this time you can manipulate both X and Y value you can not only teleport to one fake sinnoh, but three! (FFFF;0000) (0000;FFFF) (FFFF;FFFF). the one that teleports you east lands you in mapdata, which means this can be used for wrongwarping to fake sinnoh and essentially skipping all uncontrollable progression flags going north to reach a Fake Sinnoh. We already updated most big routes using this and they all take about 5 minutes at most. What you can also do is wrongwarp, which makes kt so you will spawn at whatever data is located at [Base]+1488 and then after that set flags that should be disabled outside restricted zones, save and reset and they'll still be set. For example, you could wrongwarp, leave union room (putch you at Y = FFFF in the void of the top floor of a pokemoncenter) travel about 8000 south, avoid some crashing maps by manipulating mapdata, enter an elevator which warps you to mainland. Then enter the elevator again to go dowm, overwriting the value at [Base]+1488 and then grabbing a partner like Riley and Mira, or a partner in Amity Square. Then you can save reset and you'll stilll have the partner but this time out of the restricted areas. i also made a video about that. You can also use this to get the Pal Park menu out of bounds. The route for that is put in a comment later in the post. Hey, I mainly focus on generation 4 glitches and specialise in voidspecific glitches. update! It is possible to get any partner out of bounds, including amity square partners using this, allowing you to fight dpbox when tweaking onto water! This glitch might become very useful soon enough. Basicly, if you save after the coordinate warp, it'll warp you back to the coordinate warp location (instead of explorer kits location) but with savedata of whatever you did after coordinate warping. Whats more is that elevator warps can also overwrite the warp location. If you coordinate warp, use elevator, get a partner, save reset you'll end up at the elevator's warp location. I think most warp types that have multiple locations they should warp to will allow you to do this. So you can basically teleport anywhere, that's cool ! It's possible to warp to elevator warps too, but warping with RETIRE menu would require saving first in for example a pokecenter, which wastes too much time. As in messing with flags, you save all data of your save except your coordinates/void, so I guess you could try sequence breaking things with this by warping back to a room you should've already beaten? There's probaply loads more possibilities. You can warp back with partners and amity square partners, allowing you to have doublebattles, heal yourself infinitely, have glitchbattles and such. More research is still being conducted atm. Page created in 0.312 seconds with 22 queries.